Mar. 11, 2019NEWWS.WebTV 3.1 (Release 50) available! • Where are the uploaded files stored? • Video Channels: "Fake Live"
• Selling Content Access, Memberships, Services, etc. About WS.WebTV integration with Google Analytics. 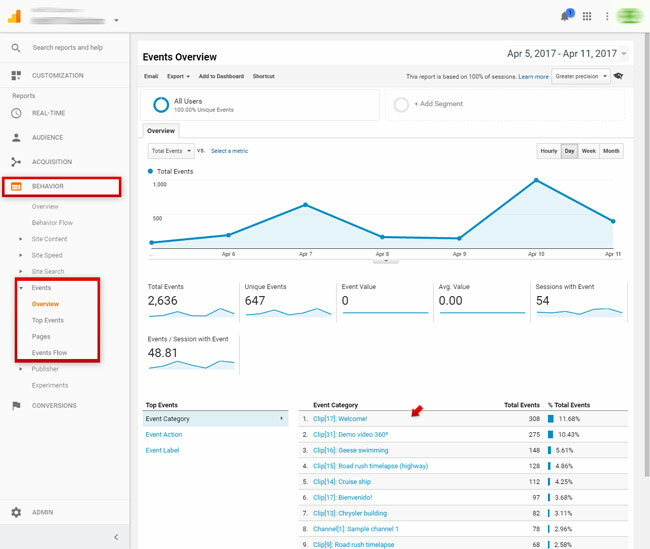 If you have included your Google Analytics tracking code into the WebTV configuration, you will be glad to know that WS.WebTV integrates with this statistic tool by registering Clip, Ad and Channel (version 2.2+ required) actions as Google Analytics Event Actions. • "Play": This is the same as "views"; this action is registered when a video started to play. • "PlayComplete": This action is registered when a video has been played back until the end. • "Play (Embed)": This action is registered when a video is played back from an embedded player. • "InteractivityView[ID]": This action is registered when an Interactivity has been displayed. Additionally, the content of the interactivity is also registered as "Event Label". • "InteractivityClick[ID]": This action is registered when an Interactivity has been clicked. Additionally, the content of the interactivity is also registered as "Event Label". • "Play": This is the same as "views"; this action is registered when the first video of the Channel started to play. • "Play (Embed)": This action is registered when the first video of the Channel started to play, on an embedded player. 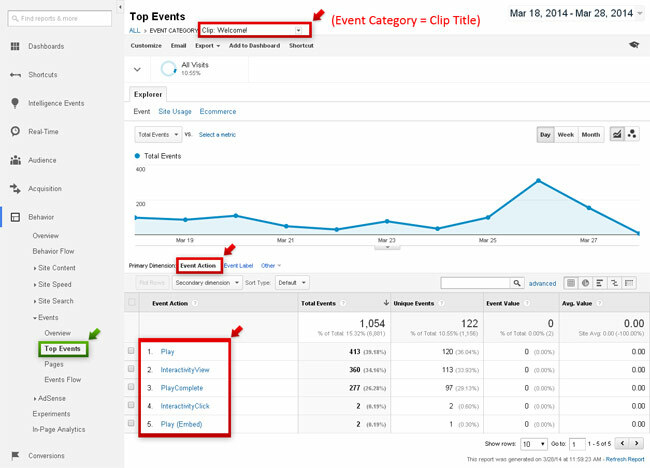 Although you can get page view statistics from the URL of the videos, like you'd do to get any other page statistics, the better way to get detailed info for Clips and Ads is by goging to "Behavior" > "Events". 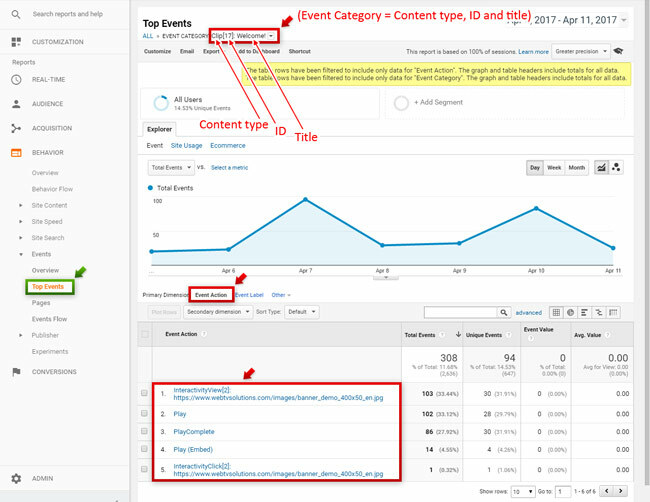 You will see that the "Event Categories" correspond to the type, ID and title of the content (Clip/Ad/Channel), this will allow you to easily apply filters to the statistics. This screen displays all Content with the corresponding statistics. As you can see, it is very easy to search and apply filters (Primary/Secondary Dimension). As you can see, the selected Content appears at the top as the "Event Category"; additionally, "Primary Dimension" is set as "Event Action"; this will display the related actions for the Clip/Ad/Channel. 1. Click the "Play" action. 2.1 On "Primary Dimension", make sure "Event Label" is selected. 2.2 On "Secondary Dimension", search for and select "Country". 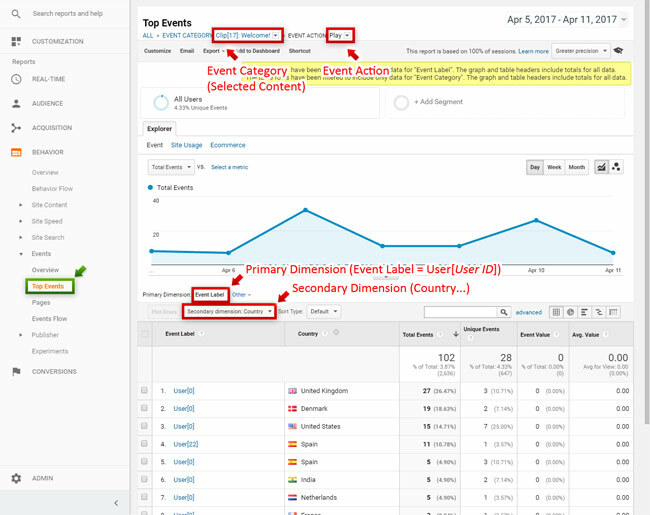 As you can see on the example above, every action has an "Event Label" which corresponds to the User which performed the action. This is very powerful in order to filter the statistics per User. The Event Label has the following form: User[UserID]. When the User ID is 0, it means that it is a "public" (logged out) User; if the number is greated than 0 then it corresponds to the ID of the User logged in the system. The previous is just an example of the endless possibilities to get statistical information. 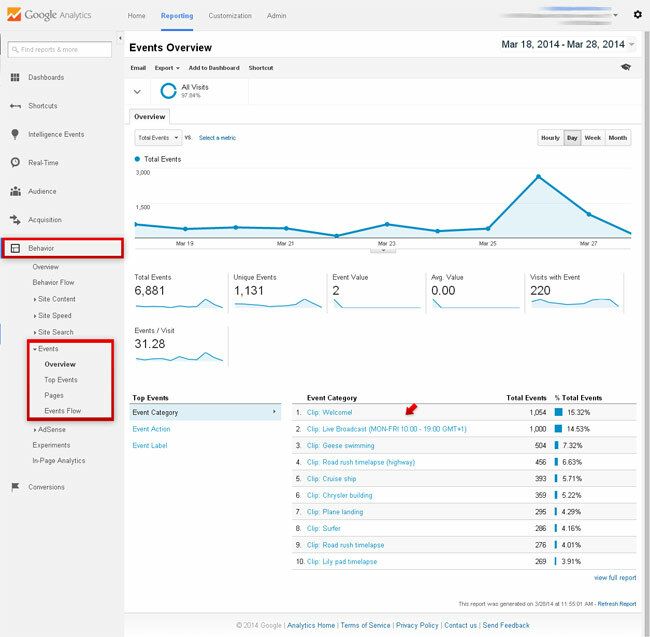 We encourage you to try yourself and familiarize with Google Analytics. Our intention by making available this brief document was only to make you aware of the integration of this great statistics tool with WS.WebTV. • "InteractivityView": This action is registered when an Interactivity has been displayed. Additionally, the content of the interactivity is also registered as "Event Label". • "InteractivityClick": This action is registered when an Interactivity has been clicked. Additionally, the content of the interactivity is also registered as "Event Label". You will see that the Clip titles correspond to "Event Categories", this will allow you to easily apply filters to the statistics. This screen displays all Clips and Ads with the corresponding statistics. As you can see, it is very easy to search and apply filters (Primary/Secondary Dimension). As you can see, the Clip/Ad title appears at the top as the "Event Category"; additionally, "Primary Dimension" is set as "Event Action"; this will display the related actions for the Clip/Ad. 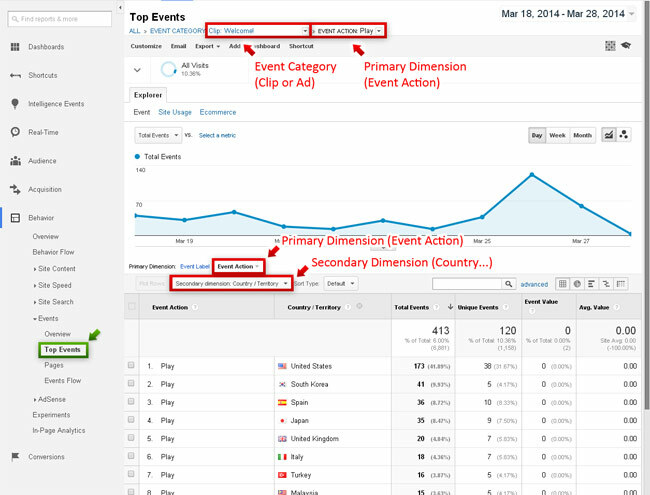 2.1 Click "Other" on Primary Dimension and search for "action" (...select "Event Action"). 2.2 Now click "Secondary Dimension" and search for "country" (...select "Country/Territory"). Copyright ©2019. WebTV Solutions. All rights reserved.